During my visit to Disneyland in August 2016, I made a dinner reservation for myself and my roommate. It was a toss up for me where I was going to choose since I’d heard great things about Cafe Orleans, but also as well as Blue Bayou. I’d heard that Cafe Orleans had the better food but Blue Bayou had the better atmosphere, overlooking the Pirates of the Caribbean attraction and all. In the end, I went with Cafe Orleans because I’m all about the food. First of all, being that I’m from Louisiana and a frequent visitor to New Orleans, I wasn’t expecting a whole lot of authenticity for the decor. I will say that it’s very nice and homey feeling to me, which is good. It doesn’t look unlike a cafe in New Orleans so I guess that’s saying something. To start, my roommate and I shared an order of Pommes Frites served with a remoulade dipping sauce. These start out as your basic Disney Parks french fries, but then they’re coated with parmesan and garlic and let me just say, all fries really should be coated with garlic and cheese. We couldn’t stop eating them! Next, we thought we should probably have something green so we shared La Salade de Maison, or the house salad. 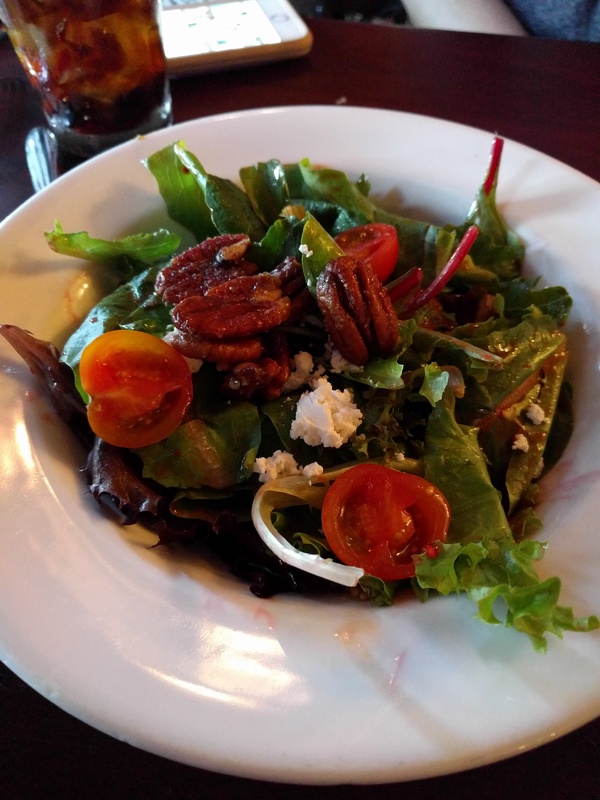 It had a raspberry vinaigrette with goat cheese and caramelized pecans. It was delicious but I’m a huge fan of fruit dressings and candied nuts on my salad. 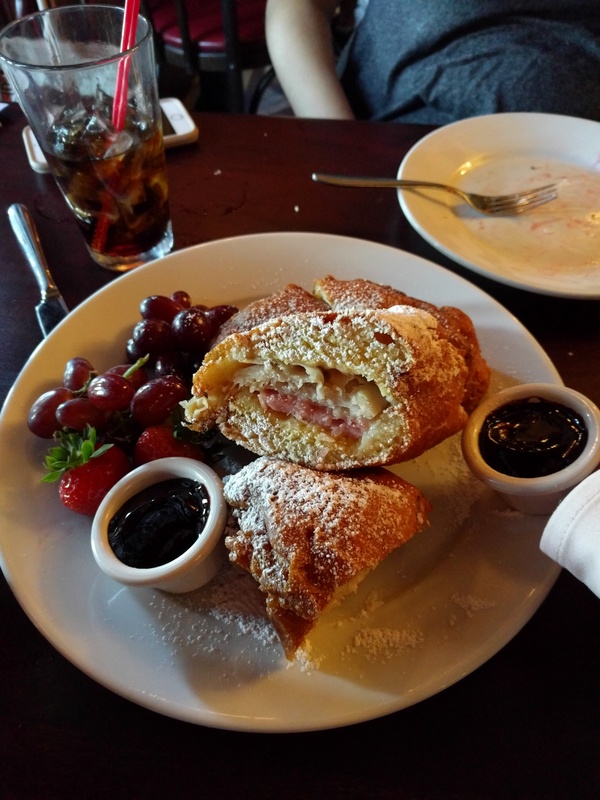 For our entree, we shared a famous Monte Cristo sandwich. This is a ham, turkey, and swiss sandwich that’s battered and fried then topped with powdered sugar and served with berry puree. There’s also some fruit on the side in case you care about being healthy, but let’s face it, you’re eating a fried sandwich. You’re not being healthy. This sandwich is obviously delicious, but it’s a very large portion. Granted, we had fries and a salad, but my roommate and I couldn’t finish this one sandwich. So we got dessert, of course. That is a Mickey shaped beignet with a dollop of vanilla frosting on the side. If you don’t know what a beignet is, it’s basically a French doughnut. Fried dough. Because everything we eat should be fried. In my defense, I did not order this. 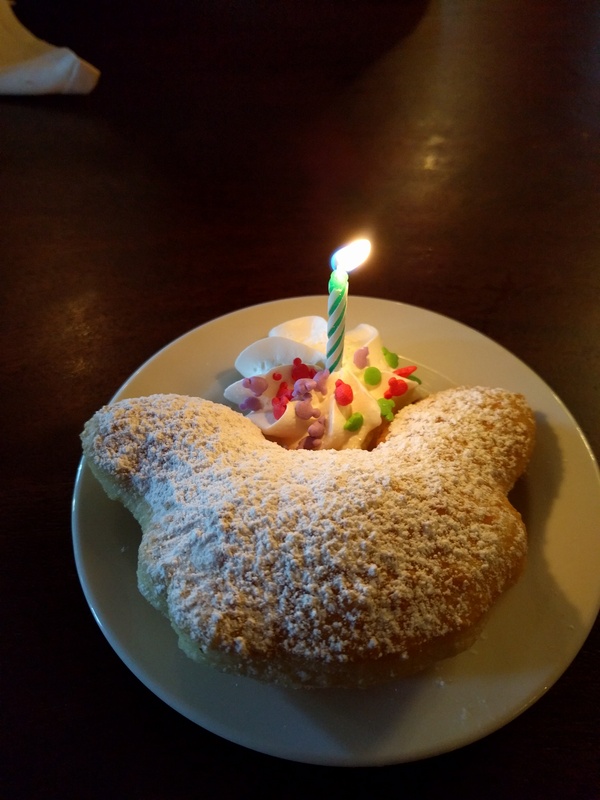 Our waitperson brought this out to me (free of charge) because I was wearing my birthday button. But me, being the kind person that I am, didn’t want to hurt her feelings so I ate it. I’m quite familiar with beignets due to where I live, and this one did not disappoint. It was hot, flaky, and covered in powdered sugar, just like a beignet ought to be. 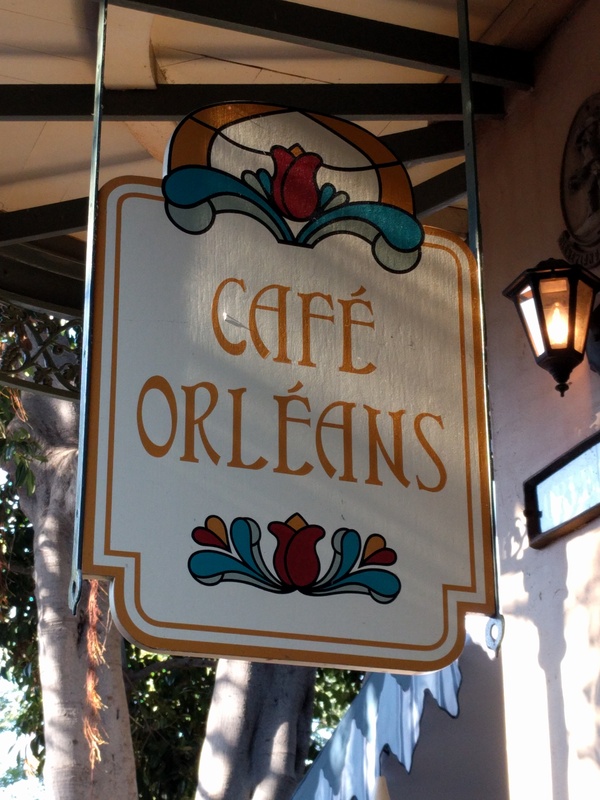 Overall, I was quite pleased with my experience at Cafe Orleans. The food was great and the atmosphere fun and laid back, just like New Orleans itself. 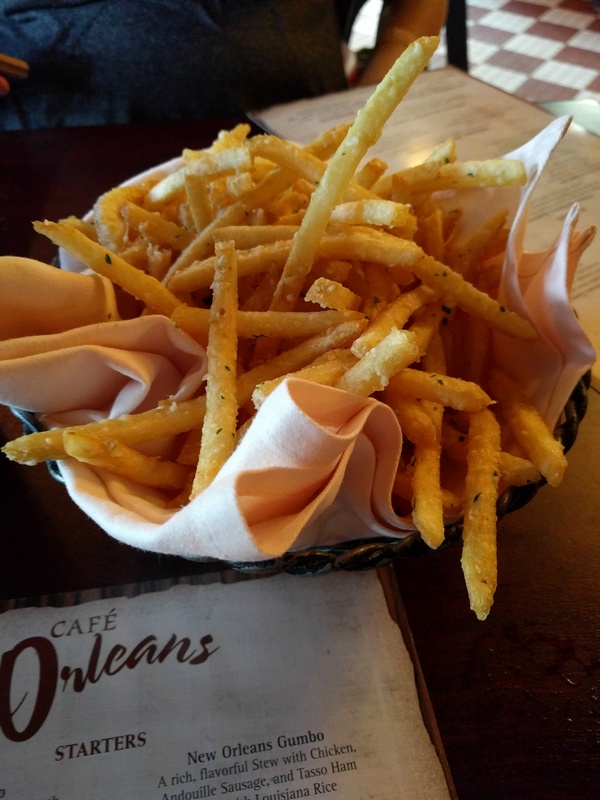 This entry was posted in Disney Dining, Disneyland and tagged Cafe Orleans, Disney Dining, Disneyland, Mickey beignet, Monte Cristo, Orleans Square, Pommes Frites by Shannon. Bookmark the permalink.